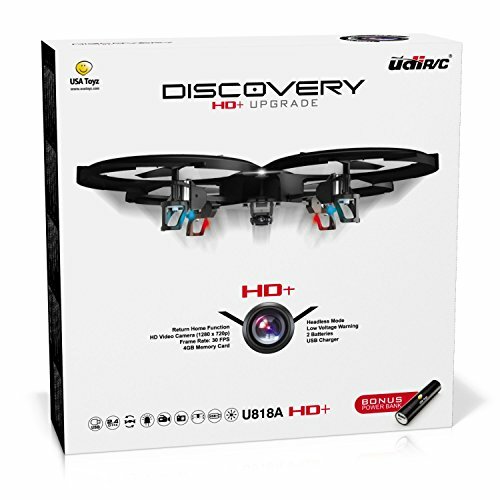 UDI 818A Discovery HD+ Quadcopter Drone w/ 720p HD+ Camera, Extra Battery & Power Bank. Explore the open skies with the Discovery RC drone - now upgraded with a 720p HD+ camera and removable 4GB Micro SD card for an even bigger, better image and video experience! BONUS PACK! GET EVERYTHING YOU NEED FOR HD+ MEDIA CAPTURE & STORAGE. The Discovery comes with an upgraded 720p HD camera, bigger Micro SD card, power bank and USB charger so you can collect even more aerial photos and video.MONITOR YOUR FLIGHT CLEARLY ON THE LCD SCREEN. The advanced transmitter features an LCD display that monitors battery power, signal strength, recording status and more.FLY AT NIGHT FOR A GREAT LIGHT SHOW. Watch as colorful LED drone lights turn this quadcopter with camera into a nighttime showstopper.GET A BONUS BATTERY & DISCOVER EVEN MORE. The Discovery delivers a whopping 18 minutes of flight time per charge thanks to the extra battery and power bank combo.SHOOT VIDEO IN EVEN HIGHER RESOLUTION. Capture video in brilliant 1080 x 720 resolution at 30 frames per second - far superior to many drones with video camera features.INCREASED STABILITY = EVEN BETTER MEDIA RESOLUTION. Drones for beginners with camera capability need better stability, and the Discovery delivers with 6-axis gyro balance.STORE MORE BIG IMAGE FILES. POST TO SOCIAL MEDIA IN A SNAP. FLY FREE IN HEADLESS MODE - DON'T WORRY ABOUT DRONE ORIENTATION. "Headless Mode" is drone-speak for a feature that allows you to fly your drone based on which way you're facing - super helpful!USE ADVANCED CONTROLS AT YOUR OWN PACE. Explore easily with the Discovery, and increase maneuverability even more with in-flight controls for pitch, roll and yaw, plus alternate Flight Modes.WOW FRIENDS W/ 1-KEY FLIPS & TRICKS. A function every drone for beginners should have! Just press a button for an impressive midair flip.TAKE OFF RIGHT OUT OF THE BOX. Drone Bundle Is Hard to Beat.1-Key Flips, Tricks & Stunts: Hit the button.